For more than forty years the “Carriage House” at the University of Pennsylvania served as a support facility for many of the functions of the International House of Philadelphia, an organization closely associated with Penn’s Christian Association. Those years, which began in 1918 and continued through 1960, represent the “highest and best” use of the building during its long life. The Carriage House first came into existence, however, as a 19th-century stable and storage facility for one of Philadelphia’s richest families. Joseph D. Potts was a railroad and international shipping executive who, in 1876, built (or more accurately, re-built) a mansion house for himself and his family at 3905 Spruce Street. Potts was already wealthy, but by the early 1880s he was one of Philadelphia’s richest men. In 1886 the Trustees of the University of Pennsylvania elected him to membership on their Board. Potts remained a Trustee of the University until his death. The Potts house took its present form in 1876, when Joseph Potts hired the Wilson Brothers architectural firm to remodel (and essentially remake) a pre-existing structure. The City of Philadelphia’s Department of Records retains the deeds which may be used to establish a chain of title to 3905 Spruce Street. Research by University Archives staff at the City Archives showed that as early as March 1868, when Joseph Janvier Woodward sold the property to Sidney A. Stevens, a “three story brick” house already stood on the site. Stevens, in turn, sold the property to Potts in October 1875. Woodward was probably the father of Joseph Janvier Woodward (1833-1884), who graduated from Philadelphia’s Central High School in 1850; the University’s School of Medicine, Class of 1853; served as a surgeon with the U.S. Army during the Civil War; and spent most of the remainder of his adult life in the Office of the Surgeon General. A search did not find any connection between the elder Woodward and the University of Pennsylvania or between Sidney A. Stevens and the University. After extensive (and expensive!) construction, Joseph Potts made 3905 Spruce Street his residence for the remainder of his life. 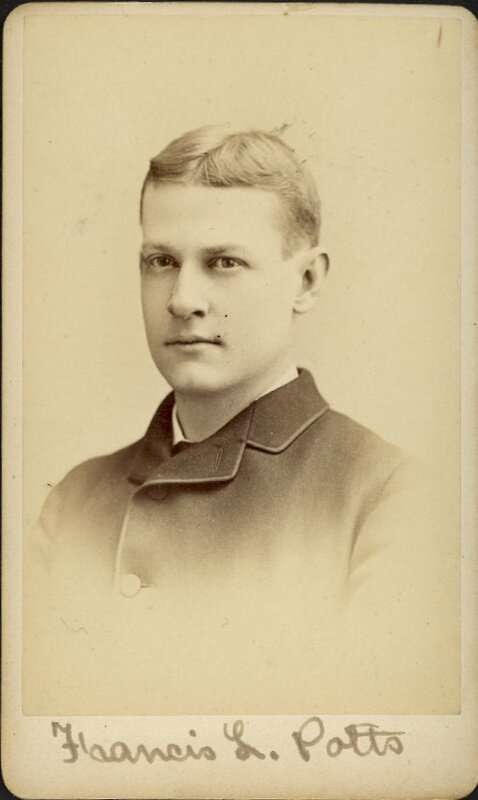 By the time he and his wife, Mary (McCleery) Potts took up residence there, the older of their two sons, William McCleery Potts (1856-1943), was already a student at Penn. William M. Potts graduated from the College in 1876 with a Bachelor of Science degree in Civil Engineering. He succeeded his father as president of the Enterprise Transportation Company and in 1911 became president of Kewanee Oil and Gas Company, which produced crude oil and petroleum in Illinois, Kansas, Oklahoma, and Texas. William Potts became even richer than his father. In 1925 he gave $10,000 to the University’s General Fund and in 1938 he gave $60,000 to the University’s Bicentennial Campaign. 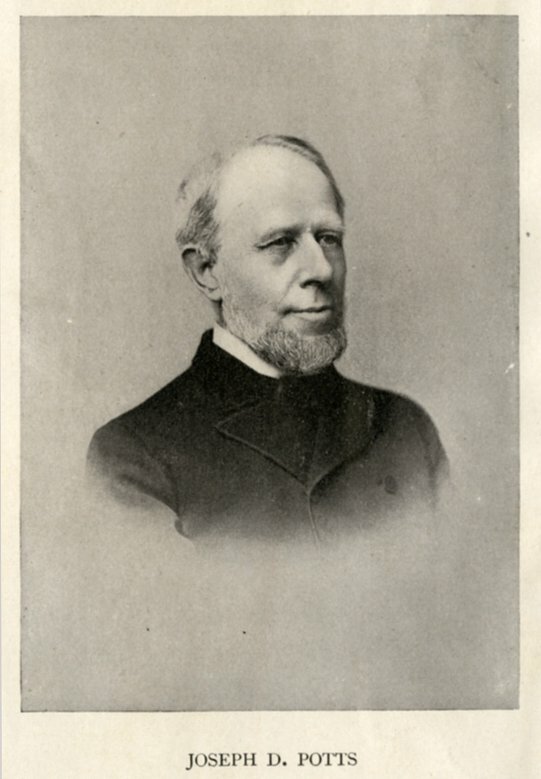 William Potts did not become active in University alumni activities, nor was he a participant in the work of the Trustees, but he was clearly a very generous benefactor. The younger of the two sons was Francis Lanier Potts (1860-1910), who graduated from the College in 1881 with a Bachelor of Science degree in Mining Engineering (for this and all biographical information which follows, see the Collections of the University Archives, Alumni Records Files, “Potts, Francis Lanier, 1881 B.S.”). Francis Potts worked first at the old family firm – the Potts Bros. Iron Company, a “rolling mill” in Pottstown, Pennsylvania – but after just a year there, he took a position as the “superintendent [of the] blast furnace” at the Isabella Furnace, in Chester, Pennsylvania. He remained at the Isabella Furnace for five years and then, in 1886, he moved to the Midvale Steel Company, in Philadelphia. After two years there he became the “assistant manager in [the] wrought iron pipe mill” of the Chester Pipe and Tube Company, in Chester. When his father died in 1894, Francis was in the sixth of his twelve years at Chester Pipe and Tube; his residence was listed at “3903 Spruce Street, Philadelphia” in the Biographical Catalogue of the Matriculates of the College 1749-1893. It therefore appears that Francis lived next door to his parents. Did he own the house or was he simply renting it and living there temporarily to assist his parents in the final years of their lives? How long did Francis live at 3903? Additional research could be undertaken to answer these questions, but they remain open at this time. In any case, Francis Potts died in March 1910, in the Bellevue-Stratford Hotel, at Broad and Walnut Streets in Philadelphia. According to his brief obituary, “Francis L. Potts, president of the Enterprise Transit Company and a director of the Fourth National Bank, died late last night at the Bellevue-Stratford Hotel. Mr. Potts, whose home was in Bryn Mawr, had been spending the winter at the hotel with his wife. He had been in poor health some months.” Like his older brother, Francis was not active in University alumni activities, nor was he a participant in the work of the Trustees. In addition, there is no record that he was a significant donor to the University. William and Francis Potts apparently married sisters, both daughters of John D. Harrison. Harrison does not appear to have had a University connection. William married Ginevra Harrison, who, in later years was known as “Mabel.” She died in December 1942, six months before his death. It does not appear that William and Mabel had any children. Francis married Caroline de Hart Harrison in 1882. She was known as “Carrie.” Francis and Carrie had one child, Helen Lanier Potts, who married Wikoff Smith. It was through Helen’s marriage that the enormous wealth of the Kewanee Oil Company eventually came to the W.W. Smith Foundation, which is today one of Philadelphia’s largest foundations and a generous supporter of many educational and medical activities of the University of Pennsylvania. Whether there was a pre-existing Carriage House in 1876 or whether the Wilson Brothers designed and constructed a new building, the result was a structure intended to conform in architectural style with Joseph Potts’ re-designed mansion house and to function as a stable and storage building, with living quarters for staff on the second floor. After the death of Joseph, in December 1893, his widow, Mary, continued to live in the house. Following her death, however, the property apparently sat vacant for a number of years. As described above Francis lived next door at 3903 Spruce Street, for at least a few years in the mid 1890s, and William lived outside Philadelphia on a suburban estate. 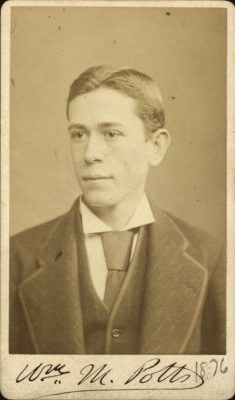 “POTTS, William McCleery, 1876 B.S.,” “POTTS, FRANCIS LANIER 1881 B.S.,” and “POTTS, JOSEPH D. Trustee, 1886-1894” (photographs and text). Alumni Records Files. Deed Registry Records, Plan 20 S 9, Plot #13. Biographical Catalogue of the Matriculates of the College, 1749-1893 (Philadelphia: By the Society of the Alumni of the College, 1894), p. 358. Edward Potts Cheyney and Ellis Paxson Oberholtzer, eds., Universities and Their Sons: University of Pennsylvania, its History, Influence, Equipment and Characteristics (Boston: R. Herndon Company, 1902), at Vol. 1, p. 400. George E. Thomas and David B. Brownlee, Building America’s First University (Philadelphia: University of Pennsylvania Press, 2000), pp. 326-328.